As Call of Duty 4: Modern Warfare\'s single player campaign unfolds, the player is introduced to new gameplay at every turn – one moment you are fast-roping from your Black Hawk helicopter after storming into the war zone with an armada of choppers, the next you are a sniper, under concealment, in a Ghillie suit miles behind enemy lines, the next you are engaging hostiles from an AC-130 gunship thousands of feet above the battlefield. 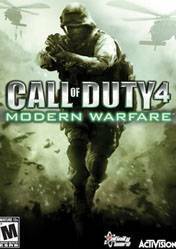 Mixed with explosive action, Call of Duty 4: Modern Warfare also delivers special effects, including use of depth of field, rim-lighting, character self-shadowing, real time post-processing, texture streaming as well as physics-enabled effects. Infinity Ward deployed a dedicated team from the start to deliver a new level of depth to multiplayer. Building on the hit \"Call of Duty 2\" online experience, Call of Duty 4: Modern Warfare\'s new multiplayer provides the community an addictive and accessible experience to gamers of all levels. + You can add mods to the multiplayer. -There is some unbalance perks. -Grenade spam can be a huge problem on high player servers. -Spawn killing can be a huge problem sometimes. Go back to the classic: the one who invented the formula of random casino kill simulator. Enjoy the vivid and meaningful solo, great soundtrack and lots of "Umpf" moments where you will breath as slowly as your character to get through some difficult moments. Revisit the classic maps and weapons, it's not as different as nowaday call of duty... but without micro transactions and DLCs! Cheap to grab and great to revisit, it's a must have on steam or console. Call of Duty 4: Modern Warfare - Gameplay Walkthrough (Part 1) "F.N.G."